Dress: Primark. Knit: H&M. Coat: New Look. 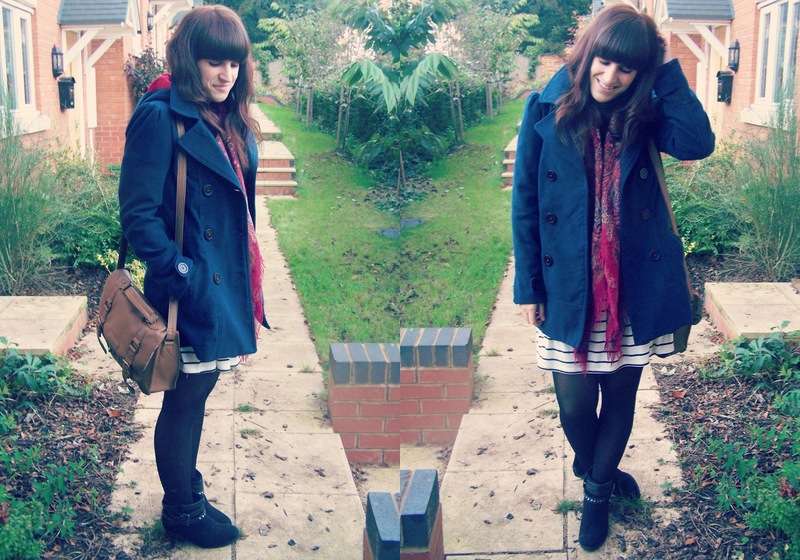 Scarf & Boots: Primark. Ooh a proper winter outfit if I do say so myself. Although funnily enough, I'd so win the award for the worlds worst winter dresser. Yes, I'm that one who still wears her 40 denier tights, and only a thin dress over a coat during the snow season. I guess I'm just useless at layering. But then totally contradicting myself, I look real snug here.. I think it's the fact the coats a little tight..! I bought these boots at the weekend, and sure enough, I've worn them everyday. Standard procedure for a new item in my wardrobe. Littlebum isn't so sure of them, but I like them a lot actually. I feel cool in them. And tonight I shall take my cool looking feet to the cinema. I think I'm more excited about having a milkshake. Chocolate fudge brownie, and mint choc chip please. Ben and Jerrys for the win.